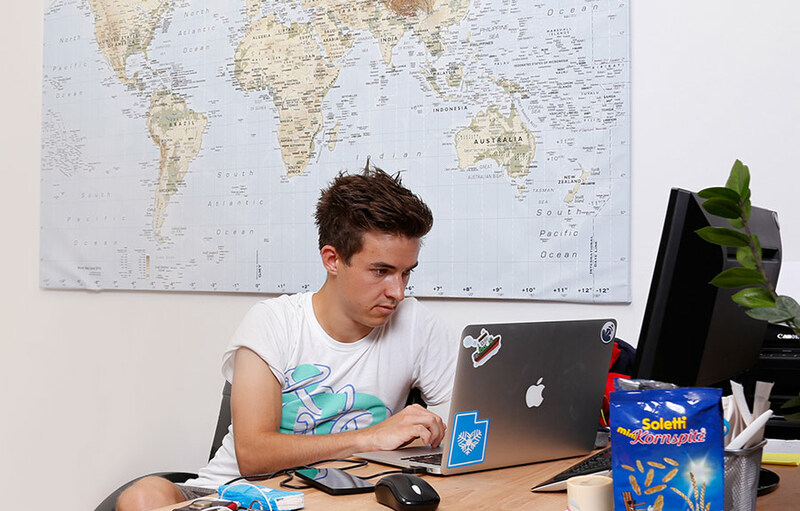 The idea for Codeship sprung out of a one-day competition in Austria in 2011. The continuous integration application didn’t win, but that didn’t stop co-founders Moritz Plassnig, Florian Motlik, and Manuel Weiss from continuing to iterate on the simply-designed development tool of their dreams. Two years later, Codeship landed in Cambridge, Massachusetts, and raised $2.6 million in Series A financing to scale. Fast-forward to 2014, during which Codeship quadrupled its active user base with only 14 employees spread across Cambridge and Europe. The startup has grown rapidly but strives to stay as customer-centric as ever. Keeping customer communications streamlined is also an important piece in Codeship’s adherence to lean software development. “We are a product for engineers, but at our core we want to solve more than a technology problem, we want to help engineers collaborate, iterate often, work more efficiently, and ultimately build better products,” says CEO Moritz Plassnig. 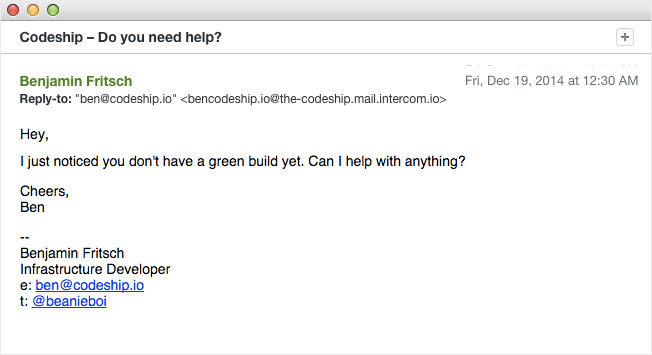 Codeship has used Intercom since its beginning for support and lifecycle marketing. Intercom helps Codeship immediately see who its users are, where they’re from, what brings them to Codeship, and at which stage in the funnel they get stuck and begin to slip away. This information is used to create over 40 custom user segments associated with important behaviors, such as number of sessions and features used. These segments become targets for automated marketing messages with specific goals that range from proactively resolving issues to upselling plans. For example, it soon became evident that there was a correlation between failed builds and user engagement. If a customer pushes code that fails their Codeship test, he or she is less likely to continue using Codeship, regardless of whether or not the issue was related. Failed builds can be demotivating, after all. So Codeship created two versions of an automessage for users who had failed a specific number of builds: one message for potential and another for active users. Both emails aim to proactively tackle a potential issue before it results in a problem or, worse, churn. The responses do reveal false positives, such as users simply creating dummy tests or simply being too busy to address the issue, but according to Moritz, most customers really appreciate being asked. More recently, Codeship has been tackling churn head on. The first step is to understand why people leave, so Codeship created this automessage to gather feedback from long-time users of canceled team accounts. 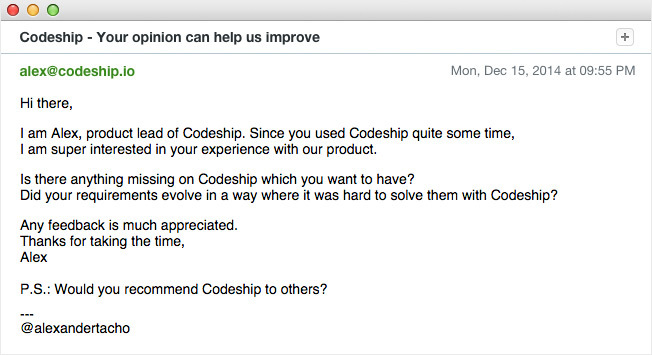 Codeship knew that loyal users usually give richer feedback. This message has received a 5% response rate so far, with every user submitting rich feedback and suggestions for ways to support bigger teams. With everything collected in a single inbox, one engineer takes a first pass through messages and assigns them to colleagues based on technical expertise required. Despite the company’s exponential growth, Mo says he likes to jump into the support queue between meetings to answer questions. As you scale it’s easy for the CEO to become more distant to customers and ultimately forget who we’re building for,” he says. “It’s important to stay empathetic. 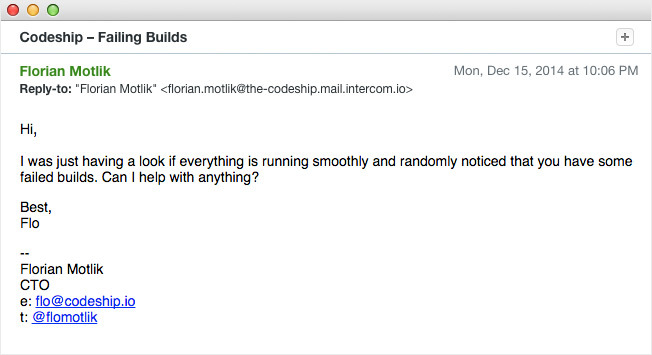 These are just a few ways Codeship uses Intercom to understand customer behavior and show customers it cares. The average open rate of its automessages is well over 70%, while response rates to requests for feedback typically fall in the 30% range. But more importantly, consolidating all customer interactions in one platform keeps the team lean and empathetic. “One of the best things about Intercom is that with a few clicks, anyone can create a customer segment without additional implementation or programming,” Moritz says. 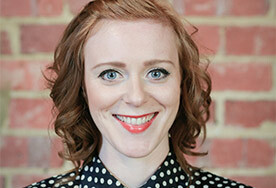 User data gets aggregated to paint a bigger picture of its customer base. Customer notes from drinkups are also added to each user’s profile page. Codeship provides hosted continuous integration and deployment software as a service for web applications.